As I am quite satisfied with my DD-5 (10 years + trouble-free operation, successfully breached "board attack attempts" by DD-6, DD-7, DD-20), I thought: Rex part could be just right for me. For me, it does not necessarily always mega analog-o. Tapes-tones, when it comes to delay. In the DD-5 interferes me, that I still have to tap 4x to set new tempo. In addition, the pedal must always be switched to the tap mode or tempo control. The T-Rex Replay Box reaches 2 times tapping. And a tapping simply overwrites the last set time poti tempo, and turning the Tempo knob overwrites the last tapped tempo. This makes LIVE everything easier and faster. Optics, size, haptics, workmanship looks great. 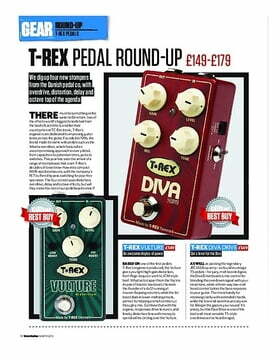 Format corresponds approximately to a transversed MXR pedal (eg Dyna Comp / Distortion + etc.). Controls are almost the same: "Mix", "Repeat" and "Tempo" are clear. The "Level" control is a quasi master volume, which can raise / lower the volume when the pedal is activated. 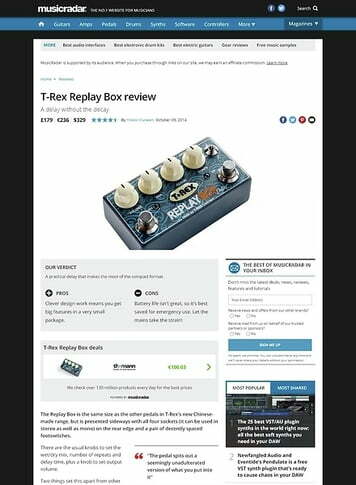 So if you do not have a 2nd foot-switchable master volume at the amp or a boost pedal at the end of the pedal board, you can use the replay box for a boost at solo level. This also saves a foot pedal if you want to lift the solo. Good extra feature. To the sound: I liked at first glance. Not very far from my listening habits of the DD-5. For example: Strat / A-string / 4th fret: apply sound -> make the string sound about 1 second -> then sound abruptly (but without producing even noises) to listen to the echo repeats. 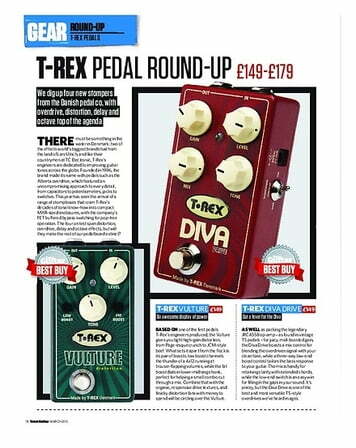 For analogue or tape delay models such as Line6 or Strymon. And I find tap subdivisions super !! However, I still do not understand why many TOP manufacturers do not equip their products with normal ACHTEL subdivisions. This is a real shortcoming !! There are tapable quarters, dotted eighths and quarter-triplets. Of course, the dotted eighth echo is one of the most famous echo rhythms. I also like to use it. Clear-YES. So really good that this point. Eighth subdivision (i following SD) is now almost on every tapable pedal. But no one appears to be strong for the eighth echo. Why?? 1) Solo of "Abracadabra" (Steve Miller Band), 2) Echo-Guitar Fill-ins in the verse of "perfect world" (Gossip), 3) If the Powerchord riff of "Everybody dance now" (C + C musicfactory) and to perform on guitars, then you also need a LAST eighth echo (with only one to one and a half repeats). 4) There are some typical guitar rhythms, in which the guitarist himself strikes already dotted eighths. A dotted eighth echo would be worthless. Here again, eighth-rehearsals are used: eg theme-rythm-reef of "Crazy" (Seal). In the original, there are only fat keyboard sounds at this point. But with clean sound, Compressor, possibly bissl chorus and even eighth-Delay one gets the guitar with almost 1 to 1.
Who is the iTüpfchen (who needs an iPhone? ), Additionally uses Wah Wah, and moves it PRO AKKORD ONLY ONCE slowly from "heel-down" to "toe-down". And finished is the varnish !! In many of these situations, the song tempo is too fast for the guitarist's foot to be able to steal CLEAN at the eighth tempo, which would be necessary with 1/4 SD. 1/8-SD is more important than 1/4 SD. Who wants to hear 1/4, taps in 1/8-SD mode simply halftime. It can be so simple. The SD-toggle also has an influence on the range-speed control in the Replay-Box. This means you are used to getting a 600ms delay, if the tempo button is set to 12 o'clock, this is no longer the case if you move the Sub Division toggle to another position. This also means that the max. 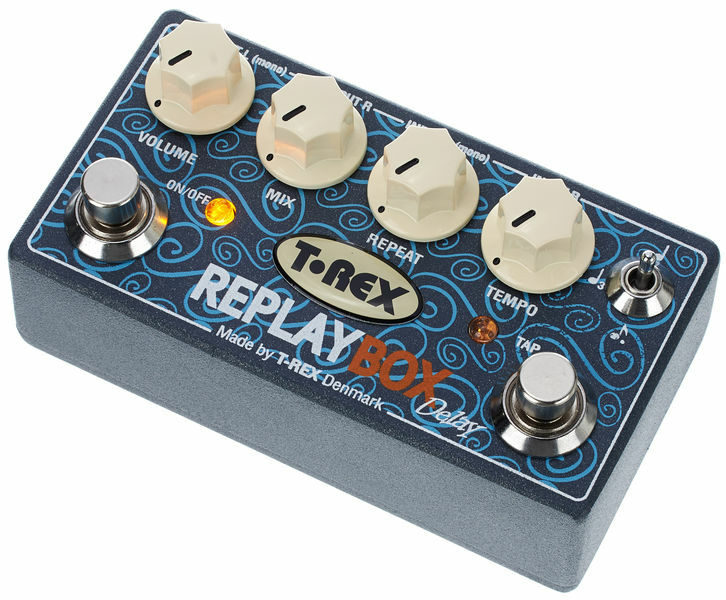 Delay time of the replay box is only possible with toggle switch in 1/4-SD position. Beautiful machine, rather knife-Swiss studio than pedal character for its very specific. The tap-tempo is always a plus, even an indispensable. The settings are complete, even if we retain one. ID: 332528 © 1996–2019 Thomann GmbH Thomann loves you, because you rock!